In advance of one of their exciting and perhaps their most financially-grounded seasons in their history, Galway United this week appealed to their fans to come together to renew one of the old city traditions of supporting Galway’s League of Ireland teams, by marching up the Dyke Road before the season opener next week. On next Friday, February 22, at 6.00pm before the opening game of the season against fancied Shelbourne, the club is asking that supporters gather at The Plots in Woodquay and march up the Dyke Road together to Eamonn Deacy Park. Music, sound, match tickets, special effects, and refreshments will be on offer at The Plots in advance of the march, the aim of which is to renew the old camaraderie and Galwayness of supporting sport in the city. As a club, they earnestly ask all Galway football clubs and sports fans in the city and county to support this venture. Reclaiming the Dyke will bring a carnival atmosphere to Eamonn Deacy Park on the opening night of the 2019 season. “We need players, parents, grandparents, men, women, boys and girls with us on the night to support our local stars. All this week and next, the Galway Advertiser and Galway United will be running competitions online on our website and social media platforms offering fans the chance to win some club merchandise for that opening game. Check our social media platforms for more details. On Sunday last at the launch of the season at the Connacht Hotel, manager Alan Murphy told the assembled fans that this season will be like no other in that the squad is built on hard work, loyalty, commitment to the club and a trust in the finest young talent available in the region. He said that he knows he will be working within the constraints of the final limitations associated with the role, but he is confident that his squad will perform to the best of their ability for the forthcoming league season. He spoke of the mistakes of the past when the club outside its means tried to bring in external quick-fix players who were gone again at the end of a season — a practice he says which is not sustainable and offers nothing for the future development of the club. His Project DNA programme aims to develop players who can make the club competitive and challenging for promotion. He said that he has put together a squad of players who see future for themselves at the club, and who do not view Galway United as just a stepping stone to other clubs. In impassioned pleas, club vice-president Bernie O’Connell and respected former goalkeeper Tommy Lally appealed to the fans to get behind the club this year and to encourage friends and relations to come along and see what will be on offer at Eamonn Deacy Park this Spring and summer. They confirmed that president Michael D Higgins will be the guest of honour at the opening game. 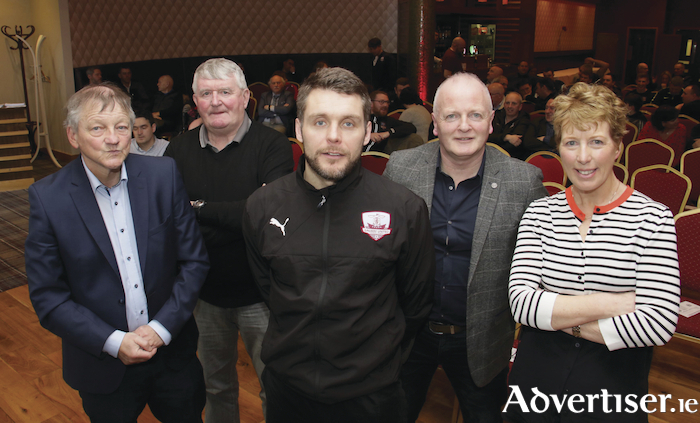 “Galway United this season embark on the DNA project of manager Alan Murphy whose ethos is to play and promote the best and brightest young local talent,” said Mr O’Connell. “No Irish club will embrace the adage of ‘Mol an Óige’ more than United. Alan is remarkably well placed to shape the club’s direction. At last there is a distinct Galway football vision and a leader committed to developing it. “Galway United Co-Op has now commenced work on its project of ‘Reclaiming The Dyke’ for our first league game of the season on Friday February 22. The ambition is for all supporters to march up the Dyke from Woodquay to Eamonn Deacy Park in support and solidarity with our young stars. “We are asking all former Galway United players, former club officials, lapsed supporters and all followers, past, present and future to be a part of that march. We want men and women, boys, girls, families with different generations involved to rally with us. “Our appeal in particular is to all who play the game at schoolboy or schoolgirl level, youth or junior football to join us on the march and at that game to pass the torch on to the new football generation. “We appeal to our Gaelic football, hurling and rugby friends and members of all sporting codes to join us. “What will you witness on the night? A very young team, our youngest ever, wonderfully talented and committed. They are young and they are ours. Hailing from our clubs, communities, from our towns and villages shaped by their families, their former mentors and the guardians of Galway game. They are Galwegian. They are ours. They are unique,” he said.